Iron Boy Publicist Emily Pandelakis sent out a press release recently proclaiming Edgar Brito Jr. as a good guy who is very supportive of the highly acclaimed Wounded Soldier Project. The 20 year old boxer (3-0-1) fights on the Iron Boy IXX Card, 2/28 at the Celebrity Theater versus Jesus Pacheco (1-4) in a rematch; Brito won a split decision over the taller Pacheco in 2014 at the same venue. The super Bantamweight pugilist knows several childhood buddies who served in the Afghanistan and Iraq wars who came home with Purple Heart Medals for their bravery and wounds suffered in war action. Out of respect for their courage and heroism, the fighter wears a “Wounded Warrior” patch to honor and support them and he doesn’t boast about his modest tribute. After reading the press release, I contacted the Mexico born introvert and he deferred the “Hero” label to his father (Sr.) who trains him and according to Edgar is his biggest supporter. His heart felt admission may be true, but I don’t know many 20 year old boxers who work a full-time job (Blue Insurance), train hard and find time to help neighbors in need. Recently, Edgar and his girl-friend didn’t hesitate to answer an elderly woman’s call to witness the signing of her last will; they met her at her bank before the couple went to work; keep in mind, they didn’t know the lady before the call and request! Edgar isn’t the only good guy in boxing. She will blush when she reads her name in my column, but Emily Pandelakis, in my opinion, will join the many boxing personalities whose face adorns the outside walls of Central Boxing Gym for contributions to boxing that aren’t on Box-Rec, but the boxing community knows her well and appreciates her energy and dedication to the sport on several levels. Emily is a boxing fan/publicist workaholic who she rarely turns down a chance to help a boxer in need despite working as a fulltime job as a mother and boxing publicist. She is Margaret Thatcher, Sister Theresa and a modern version of Robin Hood in one spiritual body and few people have her heart and passion for boxing and life in general. It should be noted that Emily doesn’t steal from the rich (Robin Hood reference) but she does give to the needy and has on occasion asked for my help; saying no Ms. Pandelakis is comparable to refusing a a request from the pope. In recent months, she has dealt with family and personal health issues while making sure she and fighters continue reach out and extend help to the poor, sick and homeless. Jose Benavidez Jr. and his younger brother David can attest to her dedication to social issues that take time to address; they’re two of her many volunteer soldiers. The non-stop volunteer once told me that she wants all of her fighters to be cognizant of ordinary people and their plight. All of her fighter pals and clients including Ray Beltran, Jose Benavidez Jr. and David Benavidez gladly answer the call when Emily needs help to solve a social issue. She never complains about her “mission” in life even though her sometimes tired look is an indication that less traveled miles would provide a nice respite; she continues to pick up her feet and trudge toward her self-defined goal post which is very idealistic. Personal Note: I could write several columns mentioning individuals who serve the Arizona boxing community well andthey don’t need to take a selfie of their endeavor and post it on instant gram, You Tube or the latest gadget deployed by the self-indulgent social media crazies. Here is a short list of additional people I would like to salute for their dedication to boxing and to helping others. Former boxer Diamond Baier came to the game late, but made an impact by fighting hard and sacrificing time and energy to help others; it is a matter of principle with the analytical Diamond. Boxing Mentor Andrew Mendez makes the list because he continues to make a difference on a daily basis after doctors told him his time on earth was unpredictable because his body was invaded by cancer; time and how he used it became more important to the father and loving husband. Despite his health scare, he continues to work with kids and hold down a full-time job; he is a remarkable and humble man who appreciates every day of his life. Susan Wheeler Hernandez and her husband are boxing junkies who volunteer their time and energy to helping others in the Arizona boxing community. Susan is another cancer survivor who thinks of others before she thinks of herself and her exhibited strength through her ongoing ordeal is remarkable. We wish Susan and her family well! 22 year old Top Rank prospect Trevor McCumby is another young restless soul who donates his time to help others. Trevor is a member of R.A.K. E a growing movement dedicated to performing random acts of kindness everywhere. The movement was started by Comedian Ricky Smith in Cleveland and has spread across the country. There are numerous variations of the concept and Trevor didn’t reveal his random act of kindness, but he is an inspiration to all of us. I would be remiss if I didn’t place Iron Boy Boxer Francisco C. De Vaca on our good guy list as well as boxing trainer and gym manager Tom Garcia. Francisco aka Panchito has drawn attention to Breast Cancer and the importance of early detection. His focus on the disease has educated women in the boxing community about the importance of tests and early treatment. Garcia isn’t a flashy guy who shares his journey, but few people know that his mother has chronic kidney disease and his work schedule and hours served as a caregiver for his mother would break most people, but Tom isn’t most people. In addition to gym manager and fight trainer, Tom is vice president of USA Boxing Arizona; wow what a load. One last Salute: Richard Soto and every member of the USA Boxing Arizona Team deserved a bow for their tireless effort to maintain the health and wellbeing of amateur boxing. It is a program with multiple benefits for children and adults. Once again, special thanks to the men and women who willing sacrifice ordinary lives to become extraordinary people. Boxing Action: A three day event (Alexis Urbina Invitational Boxing Tournament) will be held in Phoenix sometime in May; Date, time, ticket prices and location is yet to be determined. Call Knockout Boxing Club in Phoenix for further information. Suspects accused of murdering the young boxer in 2013 (Chavez & Corrales) plead guilty of second degree murder and are expected to be sentenced in Maricopa County Superior Court at a soon to be announced date…..USA Boxing Arizona is planning a Junior Olympic Tournament Cinco de Mayo Festival on May2-3 in downtown Phoenix…..If you can’t wait until May for your fix of amateur boxing; head over to Arizona Event Center in Mesa on 2/20, 21 & 22 for Arizona Golden Gloves Boxing State Championships. The center is located at 1300 S. Country Club Dr. Suite #1. GG President Kelly Fenn invites everyone to be a part of an Annual Arizona boxing tradition. On the final day (2/22) of the event; expect a tribute to Al Fenn, her father and a true pioneer in the history of Arizona Amateur boxing. On Friday hit the door before 7 p.m. and 2 p.m. on both Saturday and Sunday. For more info: call 602-779-8536 or 480-779-7716. Night of Glory: Jennifer Clift is due an apology from yours truly sorry for changing her name to Jennifer Crisp in my last column. It was an unfortunate mistake prompted partially by my knowing at least seven women named Jennifer in Maricopa County, Arizona and please don’t misconstrue that innocent remark as being insensitive or sexist. ; I do know a Jennifer Crisp.. As for my punishment, she has every right to take out a “hit” ad in a National Rifle Association sponsored periodical; hopefully she is a pacifist and won’t take aim at me. 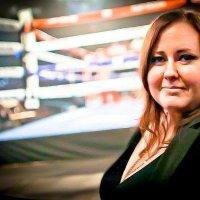 Jennifer Clift is the PR person of record for Fight Hard Promotions and she plays an integral role in Fight Hard Promotions March 20 boxing show: Night of Glory held at the Renaissance Hotel Media Center venue in Glendale, Arizona. Jennifer uses their well-crafted website www.fighthardpromotions.com to telegraph info to fans and members of the media while I prefer receiving an weekly personally addressed email with updated knowledge of the event; there is nothing static about boxing. My advice to all event coordinators is to establish a viable working relationship with members of the press and that goal can be achieved by dispatching weekly emails to writers who are vital cogs in delivering fans to the seats of area venues. Unfortunately, social media mentality now dictates new rules and old school etiquette is a thing of the past. Informing serious writers first used to be priority one, but that was before the serial blogger muscled his/her way to the forefront. Anyone connected to the internet knows what I mean when I suggest that wagging tongues and bloggers with crayons are destroying the art of conversation. Oops, I fell off my soap box. Here is a partial lineup: Vincente Cano vs. Hector Carranza-Brandon Riddell vs. Rocco Espinoza-Keenan Scott Carbajal vs. Jair Quintero-Mario Esparza vs. TBA-Abel Ramos vs. TBA & Alexis Ivan “The Beaver” Santiago defends his bantamweight title vs. Antonio Tostado Garcia in the main event. All boxing fans are well aware that bouts are subject to change; please check website for event updates and locations for ticket sales. Heavyweight Carlos Barnett hopes to be on the card; nothing definite! Boxing Briefs: Luis Elayo, from Mexico, reportedly had visa problems, so his 2/6 Los Angeles fight with Arizona prospect Abel Ramos (Casa Grande Arizona) is off, but don’t fret…Abel is fighting on the Fight Hard Promotions Card in Glendale, Arizona at the Renaissance Hotel on March 20 even though I didn’t see his name and fight info posted on the Fight Hard Website. In the next 4-5 weeks, Arizona has a great chance to bring back the gusto & luster to Arizona boxing if the 4 planned shows keep boxing fans on the edge of their seats. The way to achieve that goal is ask the commission to spend a little more time evaluating the match-ups. I heard one promoter say it was hard to know what boxing fans will see with a debut fighter in the ring. May I suggest looking at his or her amateur record weeks before the match-up dis finalized; please no tomatoes or fish on any card…they belong in a garden or river. JR Cardenas, (host of a local TV Show) will be handling announcing chores at the Phoenix Showcase boxing show on 2/21 at the Princesa Hall located at 1431 E. Dunlap in North Phoenix. Tickets are on sale at the Ben Miranda Law Office (15th Avenue in Phoenix) and available at the door of the venue after 5p.m on the day of he fight. Phoenix fighting sensation Alexis Zazueta is on the card and seating is limited, so buy now if you plan to go. I am told, parking is free. The show is promoted and produced by Maritza Miranda Saenz, President and CEO of Bout Maker Boxing Promotions. Doors at the event open after 5 p.m. expect 1st bout to start around 7 p.m. Cardenas replaces Ralph Velez Jr. as the voice for the fight; interesting choice. I hope the event does well, but Phoenix Showcase is scheduled on the same night Golden Glovers compete at the Mesa Event Center in Mesa. It is a test of strength for boxing in Phoenix and a good dilemma to have! Quick Hits: 18 year old undefeated David Benavidez (8-0) has been scratched from the Iron Boy IXX Card at the Celebrity Theater in Phoenix on 2/28 due to tenderness in his left hand. The injury isn’t considered serious and he could be ready for action in March. Aussie Wes Capper (8-0) is also off the card although he is healthy. Capper manager (Miguel Diaz) can’t be with his young undefeated fighter on that date because he will attend a Top Rank fight in China on the same day….Iron Boy is expected to add a ten round fight to the card within the next 2-3 days. Phoenix boxing prospect Emmanuel Nieves (2-0) is rumored to be on the Saturday March 13 Ft. McDowell card, but he won’t be fighting Rocco Espinoza as whispered unless Rocco opts out of his contract to fight on Fight Hard Promotions Night of Glory Card in Glendale, Saturday March 20. It would be remarkable if Rocco could pull off the double dip, a feat occasionally performed by members of the Maricopa County Sheriff’s Office; sorry, Joe! More Inside Stuff: Still seeking confirmation from fan Base executive Henri Westcott on confirmation of Janks Trotter’s rumored ring date in Boston…. Celebrated fight Promoter and boxing manager Don Elbaum would like to bring his vast promotional skills to Arizona if he can put the talent and sponsors together. He thinks the Arizona boxing market is ripe for the picking. The native New Yorker was talking to trainer Andrew Soto, (Knockout Boxing) about putting a project together, but the idea died on the vine. Elbaum managed Aaron Pryor and Tony Tubbs back in the day….55 lb. Jameel Maldonado (Azteca Boxing) left the Silver Glove Nationals with a very shiny Gold Medal. He was coached by Jose Lopez who reportedly has stepped away from coaching to concentrate on his deteriorating health. Lopez was seen at the event (courtesy of Facebook) which was held in Independence, Missouri; congratulations to Jameel and Jose! Arizona fighters Maximus Castro (Knockout Boxing) and Robert Meriwether (Knockout Boxing) failed to medal. Head coach for the Arizona Team was Andrew Soto and the fate of Zeus Pinder (Sonny’s Boxing) is unknown due to column deadline…. Damien Stone, charged with one count of prostitution, has a new Maricopa County Superior Court hearing date set for March 25,one day after his 41st birthday. The former boxing mentor and gym operator is represented by Nathaniel Carr III……16 year old Janice Santa Maria is preparing to make her amateur boxing debut soon and she is an high school honor roll student who may take a shot at the 2016 USA Olympic Team; Janice is an ambitious young woman. More Boxing Talk: California Boxing Matchmaker Edward Rodriquez (yes a q) told me before we put this edition to bed that he was proud of his card (Phoenix Showcase) scheduled for March 21 at the La Princesa, formerly the Fireman’s Union Hall located at1431 E. Dunlap in Phoenix. The venue is normally used for weddings & other social events, but the promoter (Maritza Saenz) seems very happy with the location and parking space available which we were told is free. 2 six round bouts and 6 4 round matches are on the boxing menu and tickets are available at the Ben Miranda Law Office in Phoenix on 15th Avenue. Walter Santibanes (7-2) vs. Jazzma Hogue (3-6-1) is the main event while I am curious about the 4 round match-up between Cruiserweights David Damore and Cesar Garazza. I watched David, a former Golden Gloves Champion, spar with Professional Boxer Trevor McCumby and he looked well-schooled despite a little ring rust. His two draws surprise me; but Damore may find the winners circle on 2/21 at La Princesa… Until Next Time! Click here to view a list of other articles written by Don Smith.